It was partly bald, partly covered in hair and had 15 pairs of legs, 72 spines and two antennae. It’s no wonder that worm-like creatures like Collinsium ciliosum are also known as “Hairy Collins’ Monsters”. The animal, discovered in China, lived over half a billion years ago, during the Cambrian period. This heavily armoured creature is one of the first early animals to have developed an external skeleton specialised for self defence. It adds to a growing number of weird and wonderful fossils from this dynamic period, unravelling the mysteries of how life on Earth came to be. Collinsium was discovered in Xiaoshiba – an exceptionally well-preserved fossil site in south China. It’s part of the animal group Lobopodia: worm-like creatures with legs. 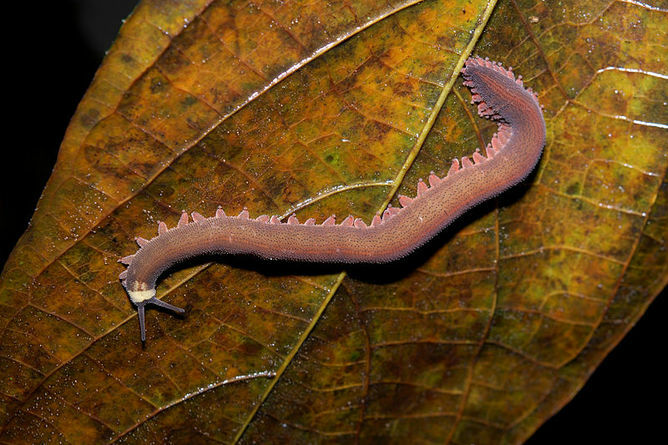 Lobopodians have existed from the Cambrian (ocean-dwelling) right up to the modern day, with examples such as velvet worms (land-dwelling). Collinsium had two antenna-like features on its head, six pairs of bristly legs and, at the rear, nine pairs of legs with tiny claws. Although Collinsium had numerous pairs of legs, they were most likely not for walking. The bristly legs were used to collect tiny floating particles of food suspended in the surrounding waters, whereas the clawed legs, with ring-like segments, helped with climbing and anchoring it on the ocean floor. Because the flexible appendages at the front end of Collinsium filtered food, it had a very basic mouth structure. This meant that it had very few oral features, for instance, no teeth. The front section was also covered in tiny hairs, unlike the back end, which was comparatively bald – with the exception of a few small clusters of hairs around glands, known as papillae. But perhaps the most incredible feature of Collinsium was its spines. These protective structures could be seen running along the creature’s back in rows, a total of 72 spines. Although lobopodians commonly have spines, most have significantly fewer than Collinsium. 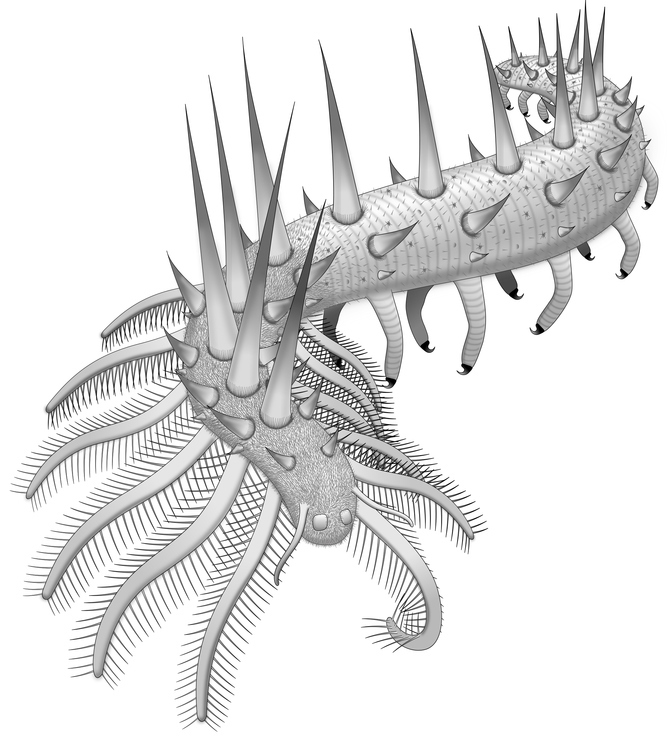 An example of this is Hallucigenia, which had two spines for each pair of legs, whereas Collinsium had up to five. Hallucigenia also differs from Collinsium in its feeding habits – Hallucigenia didn’t have the bristly, suspension-feeding limbs, as seen on Collinsium. Researchers have referred to Collinsium as “Hallucigenia on steroids”. It also appears that the spines on Collinsium, although positioned in rows, could move individually. This meant that it could point each of its spines in different directions – an excellent defensive feature when it comes to protecting yourself from predators. Collinsium’s unusual and complex body and limb structures meant that it was arguably more specialised to its environment than its living relative, the velvet worm. Now, you may assume that specialising in something would result in you being more successful, but that’s not always the case. This specialised mode of life, with extensive protective spines and distinctive limbs, came to an end for lobopodians by the middle Cambrian. It’s believed that Collinsium, alongside similar lobopodians, fitted into a palaeoecological niche during the Cambrian explosion – thriving at a time when ecological and environmental conditions were optimum for the success of this particular creature. The extinction of Collinsium could therefore have been a result of changes to its local ecology or environment (for example, alterations to the food chain). Unfortunately, since it’s difficult to fossilise the soft tissues of lobopodia, it is possible that palaeontologists will only ever be able to study a handful of specimens from sites of exceptional preservation, such as Xiaoshiba. Sadly, this is a common problem in palaeontology, but this certainly doesn’t stop incredible discoveries, such as Collinsium, enhancing our understanding of Earth’s dynamic history. Charlotte Stephenson is PhD candidate, palaeoenvironments & palaeobotany at University of Hull.